The other most frequently used motifs were lover’ knots, padlocks, clasped hands, flaming torches, angels, cupids, cherubs, and wings. Wishbones symbolised the desire for wishes fulfilled, ribbons and bows secret love and guitars, lyres and mandolins harmony in love. Dawes, Ginny Redington with Collings, Olivia. Georgian Jewellery: 1714 – 1830: Woodbridge, Suffolk: Antique Collectors’ Club, 2007. Scarisbrick, Diana. 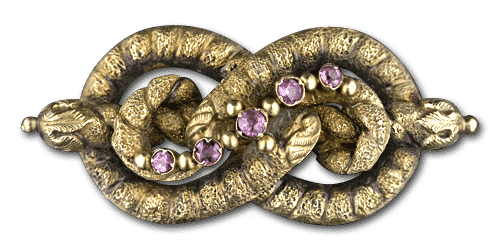 Jewellery in Britain: 1066-1837. Wilby, Norwich: Michael Russell Ltd., 1994.